A traditional marriage ceremony underway in Busoga. The Basoga, ethnically a Bantu tribe, live in the southeastern part of Uganda, between Lake Kyoga and the northern shores of Lake Victoria (known locally as Nalubaale). It is in Busoga that the waters of River Nile (locally known as Omuuga Kiira) start the long trek to the Mediterranean Sea. The Basoga believe the river is the source of their wealth and have a motto thus: Kiira bwebugaiga (the river is our wealth). Politically, Busoga is made up of Jinja , Kamuli, Iganga, Kaliro, Bugiri and Mayuge districts. With two sub-dialects, (one spoken by the Balamogi who live mainly in Kaliro district and the other by the Basiiki who occupy most of Iganga district), Lusoga is one of the most linguistically diversified languages in Uganda. However, it is also evident that Busoga is one of the regions most affected by the cultural corruption brought on by modern and alien values that are imported into Uganda from the western world. Their marriage ritual has not been spared in this respect. This cultural corruption can also be traced back to the tribe's long history of disunity in the face of possessive neighbours like Buganda, Bunyoro or the numerous Luo tribes who conquered the area at various times in the past. According to Amos Mukwaya an elderly resident of Bugembe in Jinja, traditionally, a Musoga man would identify a girl he wanted to marry and subsequently send an advance team comprising mainly of presentable and honourable male members of his family or clan. This team would be charged with getting in contact with the girl's family and gathering information about her to avoid marriages between members of the same clan. This is because, as is the case with many Ugandan tribes, people from the same clan consider themselves as siblings," Mukwaya explains. 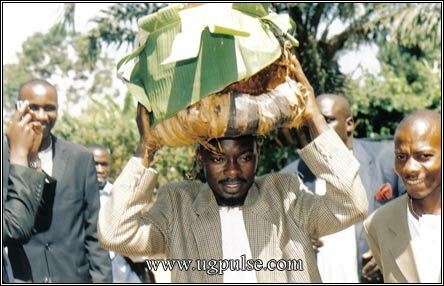 Traditional beer, delivered traditionally, is necessary to oil the proceedings at a traditional marriage ceremony in Busoga. The team of emissaries would table a formal request to introduce their son and ask for the girl's hand in marriage (okuzaliibwa mumaka). Nowadays, this is done through a letter to the family head and is delivered by the girl herself. The father does not read it alone but solicits the company of his sister while reading it. The letter always suggests a specific date on which the man intends to present himself for proper introduction. If inconvenient for the girl's family, an alternative date is chosen and communicated to the man's family in the reply. Mention of refunds for items and costs the girl's family will incur in hosting the man's entourage is made in the same reply, which is delivered by the bride to the groom. The significance of the introduction ritual (Okuzaalibwa mumaka) is enhanced by the fact that the Basoga always have a particular interest in knowing and vetting their prospective in-laws. This ritual, therefore, is a way of creating a bond that unites both families. For a mysterious man to declare himself part of the girl's family without official recognition was considered a taboo and was severely punishable. The bride communicates to her parents the progress of the eminent visit from their prospective son-in-law and her parents respond positively by providing a list of possible gifts to be brought by the man on the big day. Unlike today, the girls in Busoga were always keen on preserving their purity and sanctity for their future husbands. A girl was expected to remain a virgin until she was formally married. Before the introduction ceremony, gifts like kanzu (tunics) for the girl's father, busuuti for her mother, paternal auntie and one for the daadaa (grandmother) and any others as may be seen fit are bought by the groom. Different envelopes containing money may be prepared, each meant for a specific branch of the bride's family. As preparations for okuzaalibwa mumaka move into high gear, the girl stays in closer touch with her family and advises her prospective husband on which gifts to buy. If financial relief is needed by the girl's family to prepare for the big day, her parents will, again through their daughter, request for the same. Basoga wives are generally known to be submissive to their husband's wishes and are fond of saying Omwaami kyakoba, nzeena kyenkoba (What my husband says holds for me too). However, initially it is the girl who calls the tune and the groom dances as she is the only link between the groom's family and hers. She may edit the list of gifts her man is to bring to her parents into a more expensive one. Contrary to what is practiced by most other ethnic groups in Uganda, the Basoga do not hold ceremonies for setting the amount of bride price to be paid for their daughter, as this is communicated through their daughter, specifying their expectations and interests. The girl, who always has good knowledge of what her parents prefer, guides the groom on what kind of gifts to buy. Traditionally, the girl's parents were always keen on exploiting the opportunity of getting bride price by demanding a big amount of either cattle or money. The fortune accumulated from the girl's bride price was always saved to pay for her brothers' bride price when it was their turn to pay for someone else's daughters. Unlike the practice in Buganda, pre-okuzaalibwa mumaka visits to the girl's homestead by the groom are not entertained. Such visits are considered immoral in the sense that it would then seem like the young couple is already indulging in secret acts of marriage. 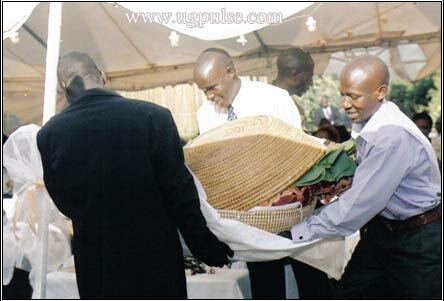 Showing financial clout: Gifts to the bride's family are a must in Busoga. 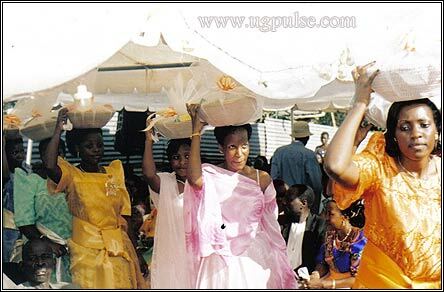 On the big day, the groom and his entourage composed mainly of his family, depart for the girl's parent's homestead, armed with such gifts as her father's kanzu (tunic), her mother's gomesi (ladies' cultural garb), envelopes stuffed with money for the girl's baseenga, bamaama, bakoojja and babaaba abaato (paternal aunties, maternal aunties, maternal uncles and paternal uncles respectively) and any other gifts that may have been requested. They should endeavor to keep time. If they arrive later than the agreed time, the entrance to the enganguu (reception venue) will certainly be closed to them. It may take skillful negotiations oiled by paying a 'fine' to convince the gatekeeper to let them through. Once received and allowed to take their seats, the entourage must stay still and remain silent, unless greeted by groups of the girl's family, after which they are requested to introduce themselves. Their spokesman then introduces them, one by one, as they stand up briefly for recognition. That accomplished, their hosts will ignore the entourage until they pay ekivumbula mumwa (mouth opener), a token that may come in the form of money given to the spokesman of the hosts. Unless the token is impressive, the visitors will continue to be ignored. The hosting side always dominates this session, asking the questions with the visitors making sure they answer carefully. The hosting spokesman inquires from the girl if she knows the visitors and obtains her views about the visiting spokesman's carefully crafted proposals. After getting familiar with the visitors, the hosting spokesman mentions a set of conditions and expectations upon which the issue of bride price can be discussed. The girl's senga (paternal auntie) takes the floor and kneels in front of her prospective son-in-law, handing him a handkerchief containing some money. The groom is expected to add double this amount of money and even exceed it by at least 10% before handing it back to the senga, or else she does not introduce him. If impressed, she will take the floor again and say good things about the groom, after which the girl's father, if convinced, will show approval. Nice things about the girl's background will be mentioned and so will her father's expectations of a privileged new life for her if the groom marries her. If the cultural conditions are also met, she is handed over to her suitor by her trusted brother and farewell bid to her. With negotiations finished and dowry payments made or referred to a future date (which some affluent families use as a test of readiness by the man to marry their daughter), a typical Christian father is always keen to know about the plans for a church wedding or alternative ways of cementing the relationship. That resolved, the traditional marriage ceremony is considered done and the couple will be separated for a while and the girl coached by her senga on her marital duties. After this, the couple is now free to live together. Most families end the reception with a party until dawn. Traditionally, weddings were conducted by an elder who administered a concoction of herbs and blessed the couple. At such ceremonies, animals were sacrificed to pay respect to and ask for the blessings of the ancestors, followed with a cultural dance and songs while congratulatory gifts were offered to the newly wed couple. However, with the Basoga now being one of the most religiously influenced tribes in Uganda, contemporary marriages are predominantly religious, with couples seeking God's blessings in houses of worship, in the presence of chosen witnesses and religious leaders. The mourning period can take as long as three to seven days, climaxing with okunaaba, a ritual where different herbs are pounded, mixed with water and sprinkled over all mourners.